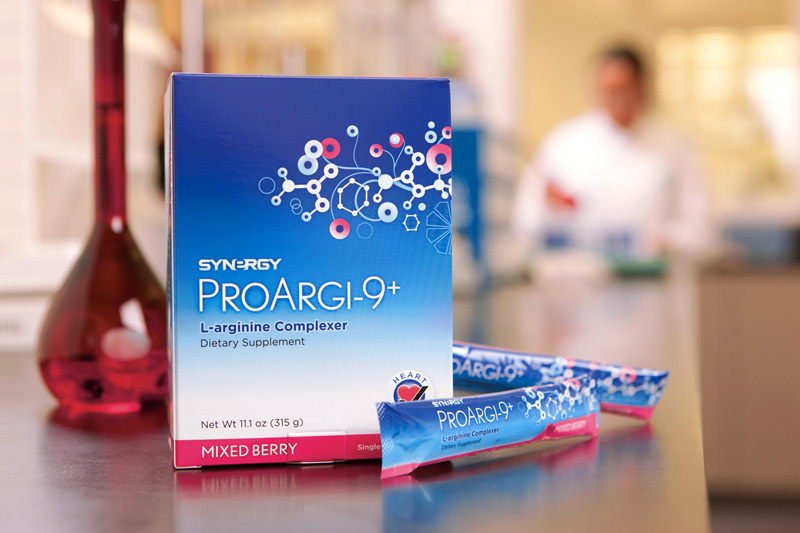 Scientists at the Hughes Center for Research and Innovation have made several remarkable discoveries on Synergy’s ProArgi-9+ formula, showing that ProArgi-9+ can do what l-arginine cannot do on its own. Following these discoveries, Nature’s Sunshine has filed a United States provisional patent application to ensure that Synergy maintains exclusive rights to this iconic formula. While the details of the patent application are not yet published, Dr. Matthew Tripp, Nature’s Sunshine’s Chief Scientific Officer, shared some insights into their discoveries. The body converts the amino acid l-arginine into nitric oxide to support healthy circulatory and cardiovascular function. Although l-arginine alone can increase the surrogate marker of saliva nitric oxide, this is a gradual process. In testing ProArgi-9+, Nature’s Sunshine found that its formula significantly and rapidly increases the level of nitric oxide in the body. The findings of this study are significant because other studies show that aging and poor diet can affect the metabolic systems responsible for producing nitric oxide, causing them to work less effectively. Healthy nitric oxide levels are important for proper vasodilation, along with blood pressure, muscle, heart and central nervous system function*. Previous studies have shown that l-arginine has no significant effect on myeloperoxidase, an enzyme that inhibits nitric oxide production. Additionally, l-arginine has no significant influence on inhibiting the oxidation of LDL cholesterol. The Hughes Center’s preliminary study discovered that the unique combination of ingredients found in Synergy’s ProArgi-9+ potently inhibited myeloperoxidase and helps to reduce the oxidation of LDL cholesterol. Together, the results of these studies indicate that the unique properties found in ProArgi-9+ positively impact cardiovascular health by supporting the production of nitric oxide and inhibiting myeloperoxidase. These findings support the use of ProArgi-9+ for optimal heart health. The Hughes Center is revealing the power that lies in Synergy products. Synergy WorldWide is incredibly fortunate to have a brilliant and seasoned staff of scientists standing behind its products, providing telling research that reinforces Synergy’s mission to leave a lasting legacy of health around the world. For a downloadable version of the press release, CLICK HERE.